On the way to the rendezvous point with Kelly, Oddball’s platoon needs to cross a river. Consulting their aerial photos from Crapgame, they find a railroad bridge still intact. But first, they must enter the railroad yards. Oddball’s three Shermans come out of the tunnel to wreck havoc on the railroad terminal. The scenario starts with the three Shermans getting a free first turn and coming out of the railroad tunnel on the unawares enemy. 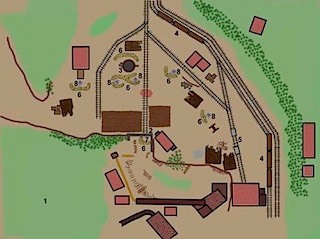 The object is to get to the other side of the map where the railroad bridge is. You need to wipe out at least 50% of the Buildings (firing at buildings NUTS! Page 30) and 50% of the Nazis before exiting. Oddball gets a penalty if they do not destroy the locomotive engine chugging thru before it exits. Penalty: Oddball loses the use of the Speakers after this scene because the gimble breaks and the records would skip. (1) Though it wasn’t shown, the assumption is that this is a garrison Company. Note: the commissioned officers are listed separate from the squads. (2) The assumption is that these are not all battleworn troops, but many raw kid recruits from Germany or foreign/forced fighters like Czechoslovakia or Poland troops with less urge to fight. Make these mostly Rep 3 and Rep 2 with a few Rep 4s. (3) Choose your attributes from page 11 of NUTS! 2nd Ed. (4) There were a lot of SMGs (machine pistols) firing on those Shermans and not one Panzerfaust or grenade. To make it interesting though, you might include some. Use Germany Army List for guidelines Page 46 of NUTS! (5) These are standard German Infantry Squads per page 11 of NUTS! 2nd Ed. There are 3 squads per platoon and there are 4 platoons altogether. You don’t need to put them all on the field. You need to make these lists. (1) At the start of the attack, none of these were manned. And when the gunners did come, these guns were still seriously undermanned. House Rules: For crew of 5 reduce spin of gun to 180 degrees per turn; for crew of 4 also reduce spin of gun to 90 degree turn; for crew of 3 also reloads are every other turn; for crew of 2 also gun cannot spin (but does have 45 degree arc). (2) Quad Mounted 2cm AC. (1) These are civilians who have no military training and therefore Rep 2. (2) These civilians are probably forced laborers of French, Polish, Check origins. There are 100 civilians working in the yard. Scatter some around if you wish to represent the movie. They will all run away. You gain nothing by killing civilians. (1) There are three box cars on this train. (2) First is normal speed/second is cross country speed. The normal speed is for going through cities. Speed for going through rail yard is 8”/turn.